While living in America, I have experienced many amazing festivals and holidays that have their own unique significance and symbolism. Amongst all of them I enjoy Thanksgiving the most, which is celebrated by everyone regardless of their faith or tradition. 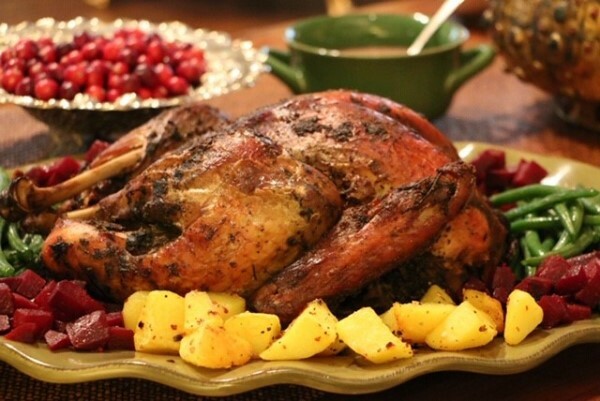 Thanksgiving is a feast, something that people enjoy all over the world. However, for me, the importance of this celebration is how Americans come together to express what they’re grateful for. It is a celebration where family bonds are reaffirmed through breaking bread together. My teenage children enjoy this celebration as they grow up and partake in aspects of both American culture and those from their homeland, Pakistan. As they assimilate in and learn about American traditions, they are particularly enamored by the ‘fun idea’ of celebrating Thanksgiving with immediate family. Maybe they can emotionally identify with this warm and welcoming tradition of Thanksgiving where everyone ‘fits in’, and there is a celebration of togetherness, compassion and deep connection and meaning in relationships. Taking a step back, I believe that food is a unique universal outlet for creating cultural links and has an ability to generate connectivity through experiencing others’ cuisines. That’s why this Thanksgiving I have decided to prepare a feast based on a fusion of the American tradition with my favourite Pakistani ingredients. I want to do this because I want my family to understand the significance and realise the joy of being part of two vibrant cultures. That way my kitchen during Thanksgiving becomes a real-life ‘melting pot’. More importantly, through my cooking I want to develop the connection, experience and memories within my family that can be passed down through generations. To cook my spicy ‘ethnic Pakistani’ turkey recipe, I start my feast preparation a day in advance. Besides turkey, my shopping list includes potatoes, onions, beetroot, long green beans, herbs and spices. The secret of my ethnic recipe is that my turkey is moist, juicy, roasted from the skin, and quite spicy. I use a variety of fragrant spices and herbs to generate a unique texture, colour and flavour. This enhances the turkey’s taste very well. 1. Remove the package of giblets and neck from the turkey cavity. Set aside for gravy. 2. Rinse the turkey in cold water and thoroughly pat it dry with paper towels inside and out. 3. Place the turkey breast side up in a large roasting pan with a rack and let it sit in the refrigerator for up to one hour before marinating. 4. 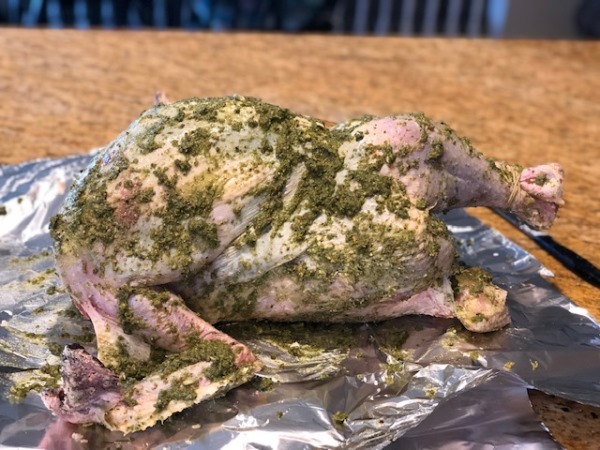 After taking it out, rub the turkey with butter and fresh lime juice all over, and season with salt, making sure to reach the crevices of the legs and wings (this helps in making the turkey moist). Be careful not to tear the delicate skin. Set aside for half an hour. 5. Heat the oil in a non-stick frying pan over medium-high heat. Add sliced onions and stir. Reduce heat to medium and fry the onions, stirring periodically until golden brown. Drain the onions on paper towels and set aside for the marinade. Tip: The fried onions in the marinade will be caramelised during roasting and will make the turkey succulent. 6. In a blender combine the minced garlic and ginger, vegetable oil, fried onions, fresh lime juice, salt, oregano, Italian seasoning, combination of roasted spices along with black pepper, fresh thyme, sage leaves and rosemary. Blend them all together and puree until smooth. 7. Apply the prepared marinade generously all over the turkey. 8. Tie the turkey legs with a double string. This process is called trussing, which is an important step in turkey preparation that helps the turkey cook evenly while the legs are roasting gently. 9. Tear off a piece of aluminium foil. The length will vary depending on the size of your turkey, but it should be three times longer than the length of the turkey. 10. Lay down the turkey on the aluminium foil in the roast pan, then cover the top of the turkey and refrigerate for 24 hours. 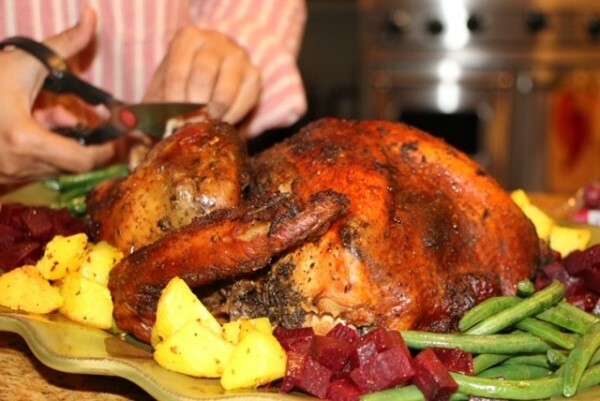 Tip: Aluminium foil makes it faster to roast the turkey and at the same time prevents it from burning. 11. Preheat the oven to 350 degrees Fahrenheit for 15 minutes. 12. Put the turkey in the oven for four to five hours. Continue to roast the turkey until a thermometer inserted into the thickest part of the thigh reads 165 to 170 degrees Fahrenheit. 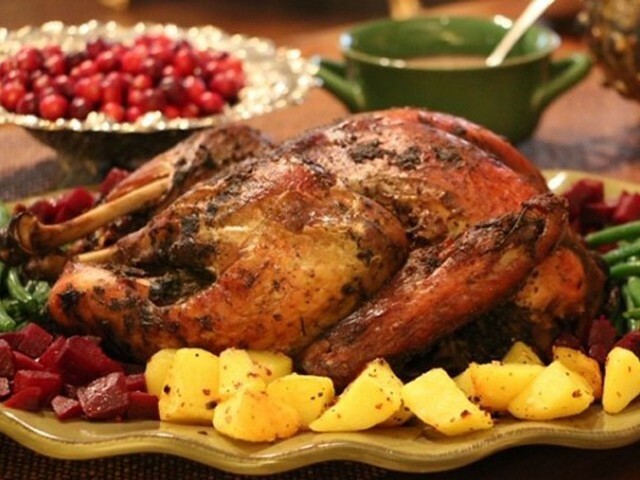 Tilt the turkey to empty the juice into the pan and preserve it for gravy. 13. Remove the foil and broil for a minute or two so the skin starts getting crispy. 14. 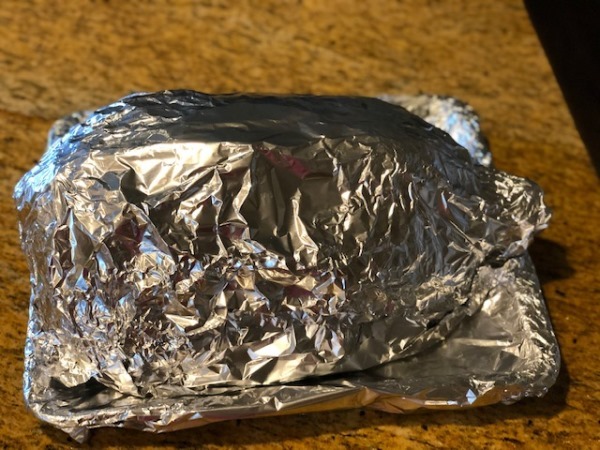 Transfer the turkey with the foil to a carving board and let it rest for at least 25 minutes. Reserve the pan and its contents for basic gravy. 15. In a large bowl, heat the chicken broth to boil. Now add the juice of the turkey which we kept for the gravy. Add the giblets and neck with garlic cloves and ginger, black pepper, cumin, salt and cinnamon powder with water. Heat them for about 30 minutes until the gravy is reduced to four cups. 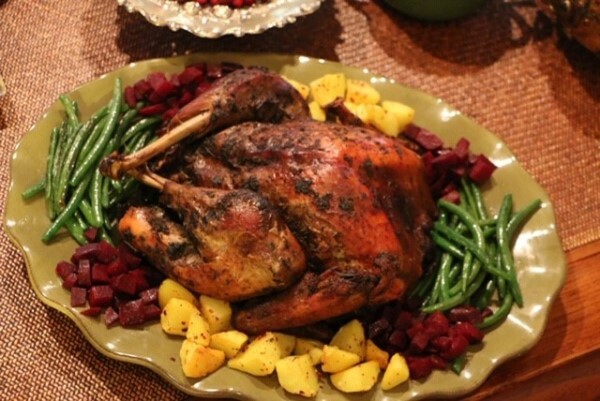 Drain and discard the giblets, neck and other raw ingredients, and set aside. 16. In the meantime, whisk water and cornstarch together in a separate bowl. Slowly add the mixture into the gravy constantly stirring for a few minutes. 17. In a large bowl, boil the beetroots and potatoes with more than two cups of water and a little bit of salt until they get tender but are still firm. 18. Drain the water and cut the vegetables into half inch cubes before stir frying. 19. Heat a large pan over medium heat with olive oil, black pepper and combination of roasted spice. Stir fry each vegetable separately in the pan for a few minutes only. Place the turkey into a platter. Serve with the gravy and stir fried vegetables. Hope you enjoy my recipe. Happy Thanksgiving! Note: Since cooking a turkey is not an easy task, I took a little help from a cookbook titled Food Turkey, especially for roasting and washing techniques. I have adapted the technique slightly with my own cooking inspiration and expertise. The author is a blogger about a variety of contemporary subjects and is based in Washington DC. She contributed to the book “Food Prints” and is currently working on her forthcoming book titled “A Taste of Pakistan in Fusion”. She tweets @ShaziahZ (twitter.com/ShaziahZ). Jeez woman! Just take the compliment!